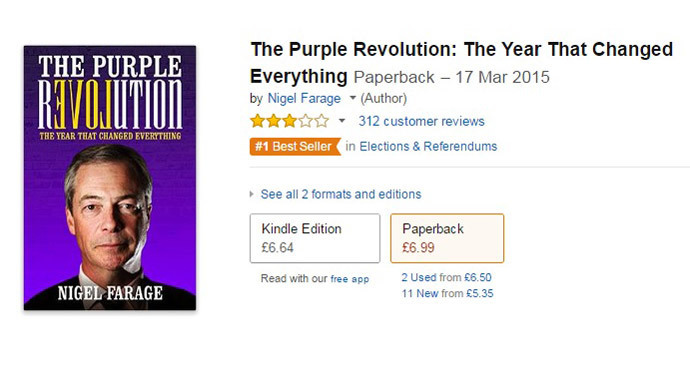 A war of words has broken out between UK Independence Party (UKIP) supporters and its detractors in the reviews section of Amazon.co.uk over Nigel Farage’s new autobiography, Purple Revolution. RT collected an assortment of the funniest and most profound reviews. In the satirical camp, Amazon user Luke thought it would make a great children’s book. While a reviewer who goes by the name of ISC found it deeply inspiring. Tiernan Douieb cast doubt on the patriotism of the publication. This reviewer was evidently expecting something more dramatic. In a final ironic review, Amazon user @johnfulthorpe pokes fun at the average reading age of Farage fans. UKIP supporter Andrew Ampers Taylor attacked Farage’s detractors for deliberating leaving bad reviews. Victoria Harrison didn’t see the joke for the drivel. Finally, a reviewer who goes by the name of Igor suggested a book which receives this much mockery must have a “lot of truth” in it.